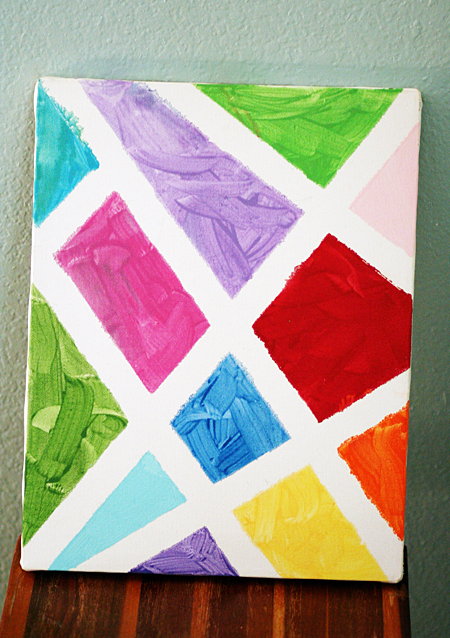 An extra canvas + masking tape + acrylic craft paints = fun new rainbow art for Delaney’s room! Delaney said the best part of this project is peeling off the tape after the paint is dry. My favorite part is seeing her brushstrokes in each little space. This particular canvas has exposed staples on the edges, so we’ll either paint the sides or attach a fun ribbon with hot glue. 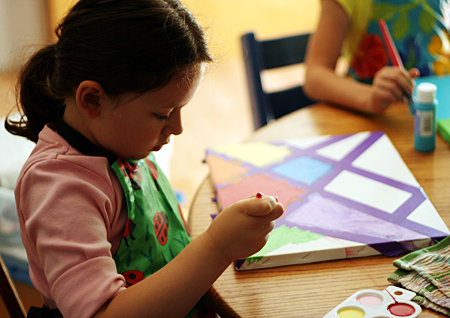 Hope you find some time to play and create this weekend! Love it! Parker loves using masking tape and watercolors. I think I will suggest it with canvas too. Right now he is working away at his new art easel and finding it so much easier to paint & draw than when it is flat. Absolutely love it. I’m thinking of making a few paintings of my own for my own apartment too!! Love it! Definitely will be trying this with my little artist! Love this! I am teaching an art class in our co-op this year, and I just may have to do this with the kids. I think they would love it! What a great idea, Love It! I am going to try this with my girls, thanks for sharing! My daughter made one of these on her own. Grandma must have given her a few hints as she created her masterpiece soon after a visit with her. Really turned out great. Fun project for all. Great idea. Will be sharing with my ECE students. Thank you for the idea! Here is a link to my blog, i liked back to this post too. When i use masking tape on canvas and then paint on it, it always peels the paint off with it. what am i doing wrong? the paint will peel off if has already dryed. peel the tape right after your done painting.